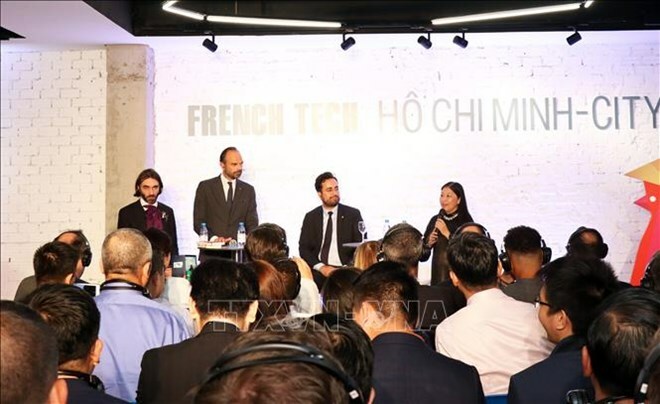 “Adaptation to the world’s changes should be regarded as opportunities for brave innovators", French Prime Minister Edouard Philippe told the Vietnam-France startup community at the France-Vietnam technological business forum (HCM City French Tech) in Ho Chi Minh City on November 4. He said in the future, not only big French enterprises and corporations but also small French businesses will contribute positively to Vietnam’s economic growth because small enterprises have advantages of creativity and innovation. He expressed his belief in the success of Vietnamese French Tech community with the help of the Vietnamese who have been trained in France and are working there. The PM highlighted the significance of the Government support for small startups. However, he stressed that startups should not rely completely on the Government support but need to overcome challenges through innovation and patience. At the forum, the French leader was introduced to Saigon Innovation Hub – SIHUB – a Vietnamese innovative startup ecosystem consisting of about 3,000 startups. Over the past five years, the hub has connected startup ecosystems of Asia-Pacific with major systems in the world. The French Tech community in Vietnam, a bridge for tech entrepreneurs and startups between Vietnam and France, has nearly 3,000 members and was recognised as France’s new technology hub in Vietnam in 2016. It is also France’s first technological hub in Southeast Asia. During the French PM’s November 2-4 visit, Vietnam and France signed an agreement on cooperation in developing technical research capacity and artificial intelligence development serving scientific purposes as well as social aspects.